Cookina reached out and asked if I'd like to hear about their new products debuting at Home Depots this summer. I'm always up for what is new in grilling and barbecue, so I said I'd be interested. The company selected the free product to send out for a fair review. I did let them know when the reusable cooking grilling sheet arrived that I never cover my grates. I once broke up with a guy after he grilled out steaks over charcoal on a sheet of tin foil (aluminum foil if you're not from the south). Well, that wasn't the only reason, but that did not score him any points when the steak was greasy and did not get much charcoal flavor. With that being said, I did try out the Cookina sheet. 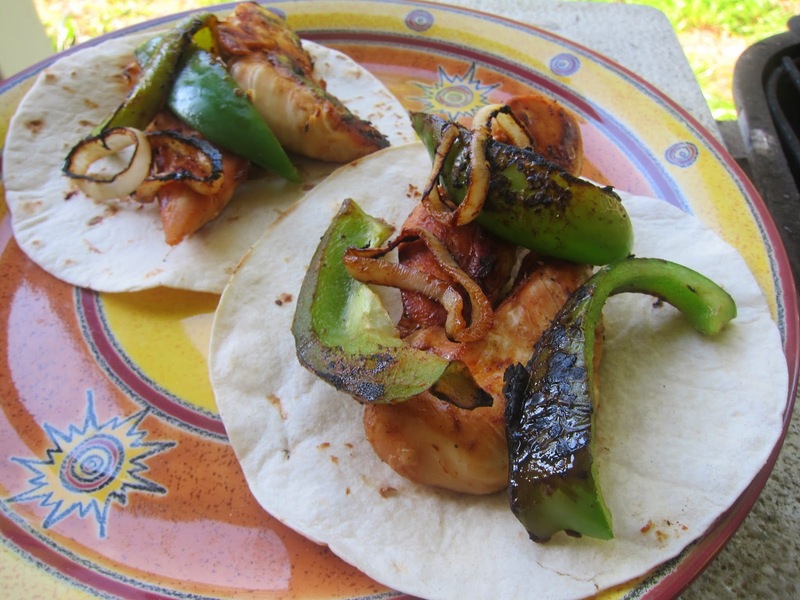 This was an evening home alone, so I decided to make fajitas with chicken, green peppers, and onions. I opted to do chicken which does not have a lot of fat, because part of what I love about grilling is that the fat falls through the grates and makes the meal healthier. 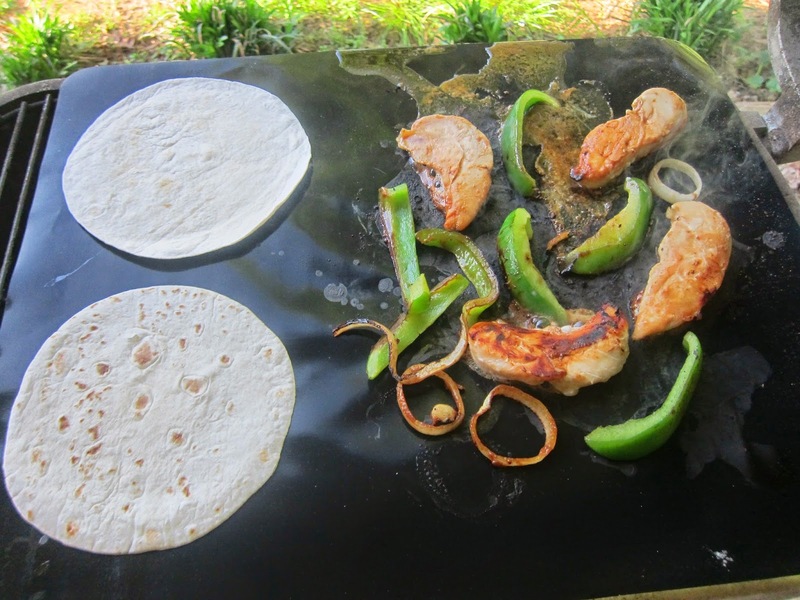 The Cookina barbecue sheet was large enough to do my meat, vegetables, and to add my tortillas right at the end to heat them up. If you just did meat, you could get quite a bit on the sheet. The grilling sheet cover held up fine to the high heat and did cook my meal. It says you get grill marks on the box. I did not on the chicken, but small chicken tenders do grill fast. The green peppers did get some markings, and the onions browned but not really with stripes. Frankly I think grill marks are overrated, but that's just me. I enjoyed my dinner. It was quite tasty. This is before I took them in and doctored them up with toppings. Then the only real clean up was washing off the Cookina sheet which comes with a scratchie cleaner. Clean up was easy. Much easier than grate cleaning. I'd recommend the Coookina Cooking Sheets for those using gas grills, since you're not looking for charcoal or wood flavor. They would be especially nice if you use a lot of marinade or barbecue sauce. Those make a mess. Higher fat meats would be a good idea. The marinade on my chicken and vegetables helped prevent sticking, but I had to add marinade about half way through when things started to stick. Do remember that what I was grilling had almost no fat at all. That's going to stick to anything. That's why I used marinade. If you hate grate cleaning, then these grill cooking sheets are the ticket. You do have to wash the sheets. Well, I guess you could buy new ones every time, but that's not very "green." They really aren't very hard to clean especially when they add the cleaning scratch pad, so that's a plus for a lot of outdoor grillers. I would like to mention the most common method of cleansing BBQ grill. All you have to do is leave your barbecue on following cooking after all your foodstuff has been taken out. As soon as you have accomplished this for about quarter of an hour, enable the grill to amazing down for close to five minutes and then use an outdated trowel, or flat piece of metallic and gently scrape equally sides of the grill to take away the sticky challenging residue. Please be aware that ceramic grills can get ruined quite effortlessly if also a lot pressure is used with sharp objects, so be careful with your option of resources.